Global Leadership is, at its essence, an enterprise which depends on breaking down barriers. In our own work at IGL, this means that our approach is interdisciplinary, building on the academic backgrounds of faculty colleagues in economics, history, international relations, law, philosophy, political science, sociology and natural sciences. The past six months have been a time of exciting collaboration with partners within the Tufts community. 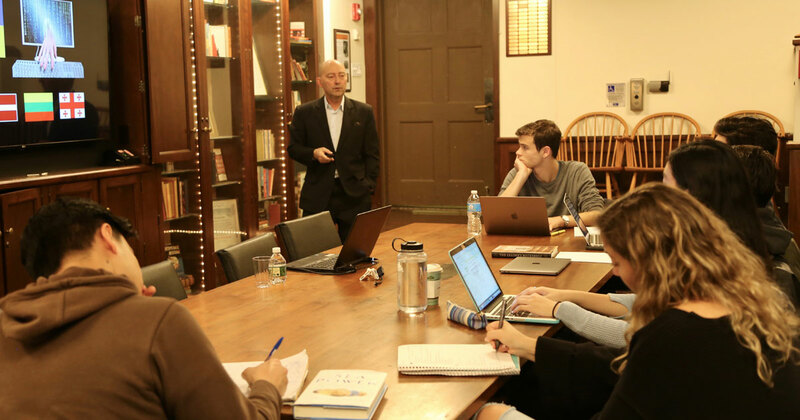 The Institute emphasized engaging faculty from both Arts and Sciences and The Fletcher School in this year’s EPIIC Course on the theme “Is the Liberal World Order Ending?”. The faculty who participated were: Paul Berkman, Professor of Practice in Science Diplomacy, The Fletcher School; David Dapice Professor of Economic emeritus; Ioannis D. Evrigenis, Professor of Political Science and Chair of the Department of Classics; Alan K. Henrikson, former Lee E. Dirks Professor of Diplomatic History at The Fletcher School; Bruce Hitchner, Professor of Classics and International Relations; Ian Johnstone, Professor of International Law at The Fletcher School; Erin Kelly, Associate Professor and Department Chair of Philosophy and Director of the Peace and Justice Studies Program; Robert L. Pfaltzgraff, Jr., the Shelby Cullom Davis Professor of International Security Studies at The Fletcher School; Richard H. Shultz, Professor of International Politics and Director of the International Security Studies Program, The Fletcher School; Alan D. Solomont, Dean of the Tisch College for Civic Life; and James Stavridis, Dean of The Fletcher School and former Supreme Allied Commander of NATO. The Institute provides a platform for ideas to be exchanged between academics, policymakers, business leaders, and civil society leaders. To this end, the Institute co-sponsored several events featuring Speakers with other schools, departments, and centers. These included: Mac Maharaj, one of the founders of Post-Apartheid South Africa (with Peace & Justice Studies, the Africana Center, The Fletcher School of Law and Diplomacy, the International Relations Program and the Office of the Provost); Wendo Aszed, the founder and Director of Dandelion Africa (with the Women’s Center and the Africana Center); Dan Shapiro, former U.S. Ambassador to Israel (with Tisch College); David Holbrooke, film producer and son of Richard Holbrooke (with Professor Bruce Hitchner); and Evan Osnos, journalist, (with the Office of the Provost, the International Relations Program, the Edward R Murrow Center for a Digital World, Fletcher School, and the Institute for Human Security). We also seek opportunities to collaborate with university partners on Conferences and Symposia to engage in dialogue and debate. The Institute co-sponsored the Tufts University Prison Initiative Symposium (with Tisch College); and the International Development Hackathon (with students from the Tufts Computer Science Department). Several Tufts professors participated in the annual ALLIES Civil-Military Relations Conference on Global Arms Trade and Foreign Intervention. IGL also co-sponsored the university’s first “Global Perspectives: A Tufts University Photo Contest”.